Thin and ultra-thin films are fine layers of materials whose thickness may measure from fractions of a nanometers to several micrometers. These materials are being used in a wide range of electronics, solar cells, and batteries due to the tremendous advantage they offer. Electronic semiconductor devices, solar cells and optical coatings are the main applications benefitting from thin film construction. As per the research report, the global thin and ultra-thin films market was valued at US$32.78 bn in 2015 and is expected to reach a valuation of US$115.41 bn by 2024. All throughout 2016 and 2024, the global market is expected to rise at a CAGR of 15.1%. Ongoing advancements and upcoming trend of miniaturization in semiconductors and solar industry is expected to boost the growth of the overall market in the coming years. The demand for thin and ultra-thin films have been on the rise due to the intensifying trend of miniaturization of semiconductors and electronic components. Design and development of printed electronics as against thin and ultra-thin films is also supporting this factor. In the coming years, the demand for these films will continue to be on the rise as the aerospace and defense industry will also utilize thin and ultra-thin films as they offer improved speed, power, efficiency, and reduced weight of miniaturized electronics. The demand for renewable energy sources such as solar energy is also estimated to be a major factor driving the thin and ultra-thin films market. The end users in the global thin and ultra-thin films market are thin film electronics, thin film batteries, and thin film PV. Of these, the thin film electronics segment held the leading share in the global market in terms of revenue in 2015, accounting for nearly 75% of the global market. The soaring usage of electronics such as mobiles, TVs, tablets, and other devices have fostered the growth of this segment. Furthermore, the widening usage of thin and ultra-thin films in microelectronics, which is a critical branch of electronics is expected to boost the share of this segment in the coming years. In terms of geography, the global thin and ultra-thin films market is segmented into North America, Asia Pacific, the Middle East and Africa, Europe, and Latin America. Of these regions, Asia Pacific is anticipated to dominate the global market in the coming years. The growing acceptance of technology across Asia Pacific and the rise of manufacturing activities are likely to give the thin and ultra-thin films market an impetus in the region. 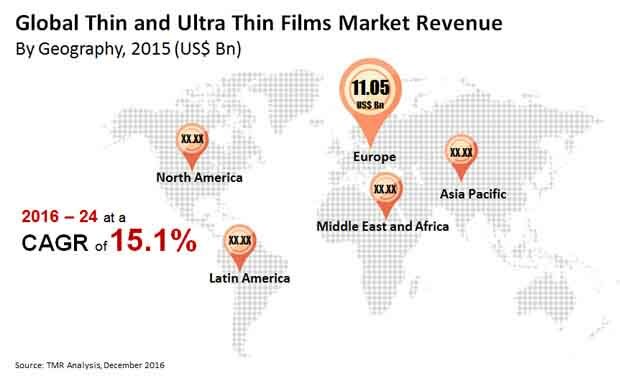 Furthermore, strengthening economies of China, Russia, and India are also expected to contribute to the rising revenue of Asia Pacific thin and ultra-thin films market. North America is also anticipated to show a significant growth rate in the overall market. Adoption of technology, increasing pressure to reduce carbon emissions, and growing acceptance of solar energy have all contributed to the increasing demand for thin and ultra-thin films market. Key players operating in the global thin and ultrathin films market are China National Building Material Company Ltd., Umicore Group, Ascent Solar Technologies, American Elements, Kaneka Corporation, and Moser Baer India Pvt. Ltd. Thin and ultra-thin films are layers of various materials deposited over a substrate to modify its properties or add extra environmental protection. These films ranges in thickness from micrometer to fractions of a nanometer. Various process of generation of thin films are utilized by various end users such as printing, physical vapor deposition of chemical vapor deposition. A comprehensive analysis of the market dynamics that is inclusive of market drivers, restraints and opportunities is included in the purview of the report. Market dynamics are the factors which impact the market growth, thereby helping to understand the ongoing trends of the global thin and ultra-thin films market. Therefore, the report provides the forecast of the global market for the period from 2016 to 2024, along with offering an inclusive study of the thin and ultra-thin films market. The major drivers driving the global thin and ultra-thin films market includes ongoing miniaturization in semiconductor and electronics industry, developments in nanotechnology and rising demand for affordable renewable energy sources. Printed electronics over thin and ultra-thin films is aiding the growth of miniaturization of semiconductors and electronics industry. Additionally with the expansion of nanotechnology in various areas of materials science the demand of thin and ultra-thin films market is expected to grow with the rising demand from food packaging, medical and semiconductor industry. Thus the above mentioned reason of downsizing a vehicle’s engine is going to drive the market for thin and ultra-thin films market during the forecast period from 2016 – 2024. Several environmental organizations and regulatory bodies such as EPA, Greenpeace and Department of Energy Resources have implemented stringent regulations to minimize carbon footprints which in turn have fuelled the demand for photovoltaic cells as a renewable energy source over the past few years. Thin film photovoltaic cells are much cheaper than traditional crystalline cells with a lower absorption rate. Thin film PV can be laid down to any kind of surface owing to its flexibility and less susceptible to damage. Thus the demand for thin film PV is also set to increase during the forecast period. Thin and ultra-thin films find its application in a number of end users such as thin film electronics, tin film batteries, thin film photovoltaic cells (PV) and others. The other segment includes optoelectronics, defense and military segments. Thin film electronics holds the leading market share among the other end users. Based on the technology type the thin and ultra-thin films market is segmented into printing and deposition process. The deposition process is further bifurcated into physical vapor deposition (PVD) and chemical vapor deposition (CVD). Printing technology held the prime market share in 2015, with the increasing popularity of printed electronics due to its lower manufacturing cost and added flexibility of the electronics is basically going to drive the printing technology of thin and ultra-films market during the forecast period from 2016 – 2024. Additionally the, Internet of Things (IoT) concept of developing everyday with internet connectivity is going to push the thin film electronics market towards its heights. The competitive profiling of the key players in the global thin and ultra-thin films market across four broad geographic regions is included in the study. These include different business strategies adopted by the leading players and their recent developments as in the field of thin and ultra-thin films. Some of the major players in the global thin and ultra-thin films market China National Building Material Company Ltd. (China), Umicore Group (Belgium), Ascent Solar Technologies (U.S.), American Elements (U.S.), Kaneka Corporation (Japan), Moser Baer India Pvt. Ltd. (India), Corning Corporation (U.S), Hanergy Thin Film Power Group (Hong Kong) and E. I. du Pont de Nemours and Company (U.S).